"Wisent" redirects here. For other uses, see Wisent (disambiguation). The European bison (Bison bonasus), also known as wisent (/ˈviːzənt/ or /ˈwiːzənt/) or the European wood bison, is a Eurasian species of bison. It is one of two extant species of bison, alongside the American bison. Three subspecies existed in the recent past, but only one survives today. Analysis of mitochondrial genomes and nuclear DNA revealed that the wisent is theoretically the result of hybridization between the extinct Steppe bison (Bison priscus) and the ancestors of the aurochs (Bos primigenius) since their genetic material contains up to 10% aurochs genomic ancestry; the possible hybrid is referred to informally as the Higgs bison, a play-on-words in reference to the Higgs boson. Alternatively, the Pleistocene woodland bison has been suggested as the ancestor to the species. European bison were hunted to extinction in the wild in the early 20th century, with the last wild animals of the B. b. bonasus subspecies being shot in the Białowieża Forest (on the Belarus-Poland border) in 1921, and the last of B. b. caucasus in the northwestern Caucasus in 1927. B. b. hungarorum was hunted to extinction in the mid-1800s. The Białowieża or lowland European bison was kept alive in captivity, and has since been reintroduced into several countries in Europe. They are now forest-dwelling. The species has had few recent predators besides humans, with only scattered reports from the 19th century of wolf and bear predation. European bison were first scientifically described by Carl Linnaeus in 1758. Some later descriptions treat the European bison as conspecific with the American bison. 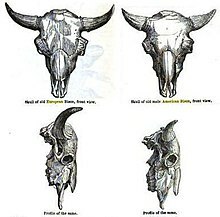 It is not to be confused with the aurochs, the extinct ancestor of domestic cattle. The modern English word wisent was borrowed in the 19th century from modern German Wisent [ˈviːzɛnt], itself from Old High German wisunt, wisant, related to Old English wesend, weosend, and Old Norse vísundr. The Old English cognate disappeared as the bison's range shrank away from English-speaking areas by the Late Middle Ages. The English word bison was borrowed around 1611 from Latin bisōn (pl. bisontes), itself from Germanic. The root *wis-, also found in weasel, originally referred to the animal's musk. The word bonasus was first mentioned by Aristotle in the 4th century BC when he precisely described the animal, calling it βόνασος (bonasos) in Greek. He also noted that the Paeonians called it μόναπος (monapos). The European bison is the heaviest surviving wild land animal in Europe; a typical European bison is about 2.1 to 3.5 m (6.9 to 11.5 ft) long, not counting a tail of 30 to 80 cm (12 to 31 in), and 1.6 to 2.1 m (5.2 to 6.9 ft) tall. At birth, calves are quite small, weighing between 15 and 35 kg (33 and 77 lb). In the free-ranging population of the Białowieża Forest of Belarus and Poland, body masses among adults (aged 6 and over) are 634 kg (1,398 lb) on average in the cases of males, with a range of 400 to 920 kg (880 to 2,030 lb), and of 424 kg (935 lb) among females, with a range of 300 to 540 kg (660 to 1,190 lb). An occasional big bull European bison can weigh up to 1,000 kg (2,200 lb) or more with a record of 1,900 kg (4,200 lb). On average, it is slightly lighter in body mass and yet taller at the shoulder than the plains bison (Bison bison bison). Compared to the American species, the wisent has shorter hair on the neck, head, and forequarters, but longer tail and horns. Historically, the lowland European bison's range encompassed most of the lowlands of northern Europe, extending from the Massif Central to the Volga River and the Caucasus. It may have once lived in the Asiatic part of what is now the Russian Federation. The European bison is known in southern Sweden only between 9500 and 8700 BP, and in Denmark similarly is documented only from the Pre-Boreal. It is not recorded from the British Isles nor from Italy or the Iberian Peninsula. A possible ancestor, the extinct steppe bison, B. priscus, is known from across Eurasia and North America, last occurring 7,000 BC, and is depicted in the Cave of Altamira and Lascaux. Another possible ancestor, the Pleistocene woodland bison, B. schoetensaki, was last present 36,000 BC. 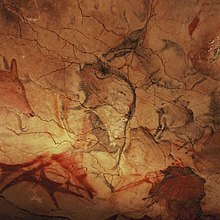 Cave paintings appear to distinguish between B. bonasus and B. priscus. Within mainland Europe, its range decreased as human populations expanded and cut down forests. The last references (Oppian, Claudius Aelianus) to the animal in the transitional Mediterranean/Continental biogeographical region in the Balkans in the area of modern borderline between Greece, North Macedonia and Bulgaria date to the 3rd century AD. Its population in Gaul was extinct in the 8th century AD. The species survived in the Ardennes and the Vosges Mountains until the 15th century. In the Early Middle Ages, the wisent apparently still occurred in the forest steppes east of the Urals, in the Altay Mountains, and seems to have reached Lake Baikal in the east. The northern boundary in the Holocene was probably around 60°N in Finland. European bison survived in a few natural forests in Europe, but their numbers dwindled. The last European bison in Transylvania died in 1790. In the Polish-Lithuanian Commonwealth, European bison in the Białowieża Forest were legally the property of the Grand Dukes of Lithuania until the third partition of Poland. Wild European bison herds also existed in the forest until the mid-17th century. Polish kings took measures to protect the bison. King Sigismund II Augustus instituted the death penalty for poaching a European bison in Białowieża in the mid-16th century. In the early 19th century, after partitions of Poland and Lithuania Russian czars retained old Lithuanian laws protecting the European bison herd in Białowieża. Despite these measures and others, the European bison population continued to decline over the following century, with only Białowieża and Northern Caucasus populations surviving into the 20th century. During World War I, occupying German troops killed 600 of the European bison in the Białowieża Forest for sport, meat, hides and horns. A German scientist informed army officers that the European bison were facing imminent extinction, but at the very end of the war, retreating German soldiers shot all but nine animals. The last wild European bison in Poland was killed in 1921. The last wild European bison in the world was killed by poachers in 1927 in the western Caucasus. By that year, fewer than 50 remained, all held by zoos. To help manage this captive population, Dr. Heinz Heck began the first studbook for a nondomesticated species, initially as a card index in 1923, leading to a full publication in 1932. Parallel efforts to reintroduce European bison have been made in Poland. Between 1920 and 1928 there were no single European bison in the Białowieża Forest. 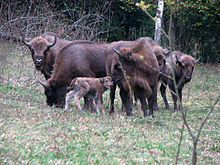 The European bison was successfully reintroduced there in 1929 from the animals kept in zoos with 16 animals living in Białowieża Forest as of 1 September 1939. The first two bisons were released into nature to the Białowieża Forest in 1952. By 1964 more than 100 existed. The wisent is probably a descendant of hybrids between steppe bison and aurochs. Y chromosome analysis associated wisent and American bison. An earlier study, using amplified fragment-length polymorphism fingerprinting, showed a close association of wisent and American bison and probably with yak. It noted the interbreeding of Bovini species made determining relationships problematic. European bison can cross-breed with American bison. The products of a German interbreeding programme were destroyed after the Second World War. This programme was related to the impulse which created the Heck cattle. The cross-bred individuals created at other zoos were eliminated from breed books by the 1950s. A Russian back-breeding programme resulted in a wild herd of hybrid animals, which presently lives in the Caucasian Biosphere Reserve (550 animals in 1999). Wisent-cattle hybrids also occur, similar to North America beefalo. Cattle and European bison hybridise fairly readily, but the calves cannot be born naturally (birth is not triggered correctly by the first-cross hybrid calf, so they must be delivered by Caesarian section). First-generation males are infertile. In 1847, a herd of wisent-cattle hybrids named żubroń was created by Leopold Walicki. The animals were intended to become durable and cheap alternatives to cattle. The experiment was continued by researchers from the Polish Academy of Sciences until the late 1980s. Although the program resulted in a quite successful animal that was both hardy and could be bred in marginal grazing lands, it was eventually discontinued. Currently, the only surviving żubroń herd consists of just a few animals in Białowieża Forest, Poland and Belarus. In 2016, the first whole genome sequencing data from two European bison bulls from the Bialowieza Forest revealed that the bison and bovine species diverged from about 1.7 to 0.85 Mya through a speciation process involving limited gene flow. These data further support the occurrence of more recent secondary contacts, posterior to the divergence between Bos primigenius primigenius and Bos p. namadicus (ca. 150,000 years ago), between the wisent and (European) taurine cattle lineages. An independent study of mitochondrial DNA and autosomal markers confirmed these secondary contacts (with an estimate of up to 10% of bovine ancestry in the modern wisent genome) leading the authors to go further in their conclusions by proposing the wisent to be a hybrid between steppe bison and aurochs with an hybridization event originating before 120,000 years ago. This is also consistent with the apparent Bos origin of the mitochondrial DNA. Some of the authors however support the hypothesis that similarity of wisent and cattle (Bos) mitochondrial genomes is result of incomplete lineage sorting during divergence of Bos and Bison from their common ancestors rather than further post-speciation gene flow (ancient hybridization between Bos and Bison). But they agree that limited gene flow from Bos primigenius taurus could account for the affiliation between wisent and cattle nuclear genomes (in contrast to mitochondrial ones). Alternatively, genome sequencing completed on the Pleistocene woodland bison (B. schoetensaki), and published in 2017, posit that genetic similarities between the Pleistocene woodland bison and the wisent suggest that B. schoetensaki was the ancestor of the European wisent. Although superficially similar, a number of physical and behavioural differences are seen between the European bison and the American bison. The European bison has 14 pairs of ribs, while the American bison has 15. Adult European bison are (on average) taller than American bison, and have longer legs. European bison tend to browse more, and graze less than their American relatives, due to their necks being set differently. Compared to the American bison, the nose of the European bison is set further forward than the forehead when the neck is in a neutral position. The body of the European bison is less hairy, though its tail is hairier than that of the American species. The horns of the European bison point forward through the plane of their faces, making them more adept at fighting through the interlocking of horns in the same manner as domestic cattle, unlike the American bison, which favours charging. European bison are less tameable than the American ones, and breed with domestic cattle less readily. The European bison is a herd animal, which lives in both mixed and solely male groups. Mixed groups consist of adult females, calves, young aged 2–3 years, and young adult bulls. The average herd size is dependent on environmental factors, though on average, they number eight to 13 animals per herd. Herds consisting solely of bulls are smaller than mixed ones, containing two individuals on average. European bison herds are not family units. Different herds frequently interact, combine, and quickly split after exchanging individuals. Territory held by bulls is correlated by age, with young bulls aged between five and six tending to form larger home ranges than older males. The European bison does not defend territory, and herd ranges tend to greatly overlap. Core areas of territory are usually sited near meadows and water sources. The rutting season occurs from August through to October. Bulls aged 4–6 years, though sexually mature, are prevented from mating by older bulls. Cows usually have a gestation period of 264 days, and typically give birth to one calf at a time. On average, male calves weigh 27.6 kg (60.8 lb) at birth, and females 24.4 kg (53.8 lb). Body size in males increases proportionately to the age of 6 years. While females have a higher increase in body mass in their first year, their growth rate is comparatively slower than that of males by the age of 3–5. Bulls reach sexual maturity at the age of two, while cows do so in their third year. European bison have lived as long as 30 years in captivity, although in the wild their lifespans are shorter. Productive breeding years are between four and 20 years of age in females, and only between six and 12 years of age in males. European bison feed predominantly on grasses, although they also browse on shoots and leaves; in summer, an adult male can consume 32 kg of food in a day. European bison in the Białowieża Forest in Poland have traditionally been fed hay in the winter for centuries, and vast herds may gather around this diet supplement. European bison need to drink every day, and in winter can be seen breaking ice with their heavy hooves. Despite their usual slow movements, European bison are surprisingly agile and can clear 3-m-wide streams or 2-m-high fences from a standing start. The protection of the European bison has a long history; between the 15th and 18th centuries, those in the Forest of Białowieża were protected and their diet supplemented. Efforts to restore this species to the wild began in 1929, with the establishment of the Bison Restitution Centre at Białowieża, Poland. Subsequently, in 1948, the Bison Breeding Centre was established within the Prioksko-Terrasny Biosphere Reserve. The modern herds are managed as two separate lines – one consisting of only Bison bonasus bonasus (all descended from only seven animals) and one consisting of all 12 ancestors, including the one B. b. caucasicus bull. The latter is generally not considered a separate subspecies because they contain DNA from both B. b. bonasus and B. b. caucasicius, although some scientists classify them as a new subspecies, B. b. montanus. Only a limited amount of inbreeding depression from the population bottleneck has been found, having a small effect on skeletal growth in cows and a small rise in calf mortality. Genetic variability continues to shrink. From five initial bulls, all current European bison bulls have one of only two remaining Y chromosomes. European bison reserve in Spain, where a reintroduction programme in Castile and Leon is in place. Beginning in 1951, European bison have been reintroduced into the wild, including some areas where they were never found wild. Free-ranging herds are currently found in Poland, Lithuania, Belarus, Ukraine, Bulgaria, Romania, Russia, Slovakia, Latvia, Kyrgyzstan, and Germany, and in forest preserves in the Western Caucasus. Białowieża Forest, an ancient woodland that straddles the border between Poland and Belarus, is now home to 800 wild bison. Herds have also been introduced in Moldova (2005), Spain (2010), Denmark (2012), and the Czech Republic (2014). Belarus: 1428 animals in 2016. Bulgaria: Around 150 animals in north-eastern Bulgaria; a smaller population has been reintroduced in the eastern Rhodope Mountains. Czech Republic: 106 animals in 2017. Denmark: Two herds were established in the summer of 2012, as part of conservation of the species. First, 14 animals were released near the town of Randers, and later, eight animals on Bornholm. France: One herd was established in 2005 in the Alps near the village of Thorenc (close to the city of Grasse), as part of conservation of the species. In 2015, it contained around 50 animals. Germany: A herd of eight wisents was released into nature in April 2013 at the Rothaarsteig natural reserve near Bad Berleburg (North Rhine-Westphalia). As of May 2015, 13 free-roaming wisents lived there.. In September 2017 one of the free-living Polish animals swam the border river Odra and migrated to Germany. It was probably the first wild bison in Germany from about 250 years. It was shot on 17 September 2017 by German hunters. Lithuania: 214 free-ranging animals as of 2017. Netherlands: Kraansvlak herd established in 2007 with three wisents, and expanded to six in 2008; the Maashorst herd established in 2016 with 11 wisents; and the Veluwe herd established in 2016 with a small herd. numbers in the end of 2017 are: Kraansvlak 22, Maashorst 15 and the Veluwe 5 what brings the total population to 42. Poland: As of 2014 they were 1,434 animals, out of which 1,212 were in free-range herds, and 522 belong to the wild population in the Białowieża Forest. Compared to 2013, the total population increased by 4.1%, while the free-ranging population increased by 6.5%. The data for 31 December 2016 showed 1,698 animals living in Poland of which 1,455 are in free-range herds. The data for 31 December 2017 showed 1873 animals living in Poland of which 1635 are in free-range herds. Romania: Almost 100 animals, population slowly increasing. Slovakia: A bison reserve was established in Topoľčianky in 1958. 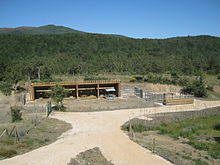 The reserve has a maximum capacity of 13 animals but has bred around 180 animals for various zoos. There is also a wild breeding herd of 16 animals (2013) in Poloniny National Park with increasing population. Spain: Two herds in northern Spain were established in 2010. Ukraine: A population of around 240 animals, population is unstable and decreasing. Since 1983, a small reintroduced population lives in the Altai Mountains. This population suffers from inbreeding depression and needs the introduction of unrelated animals for "blood refreshment". In the long term, authorities hope to establish a population of about 1,000 animals in the area. One of the northernmost current populations of the European bison lives in the Vologodskaya Oblast in the Northern Dvina River valley at about 60°N. It survives without supplementary winter feeding. Another Russian population lives in the forests around the Desna River on the border between Russia and Ukraine. The north-easternmost population lives in Pleistocene Park south of Chersky in Siberia, a project to recreate the steppe ecosystem which began to be altered 10,000 years ago. Five wisents were introduced on 24 April 2011. The wisents were brought to the park from the Prioksko-Terrasny Nature Reserve near Moscow. Winter temperatures often drop below −50 °C. Four of the five bison have subsequently died due to problems acclimatizing to the low winter temperature. In June 2012, one male and six females were moved to the Danish island of Bornholm. The plan is to release these animals into the wild after five years of adjusting to the island's environment. The plan is that the bison will aid biodiversity by naturally maintaining open grassland. In 2011, three bison were introduced into Alladale Wilderness Reserve in Scotland. Plans to move more into the reserve were made, but the project failed due to not being "well thought through". In April 2013, eight European bison (one male, five females, and two calves) were released into the wild in the Bad Berleburg region of Germany, after 850 years of absence since the species became extinct in that region. Plans are being made to reintroduce two herds in Germany and in the Netherlands in Oostvaardersplassen Nature Reserve in Flevoland as well as the Veluwe. In 2007, a bison pilot project in a fenced area was begun in Zuid-Kennemerland National Park in the Netherlands. Because of their limited genetic pool, they are considered highly vulnerable to illnesses such as foot-and-mouth disease. In March 2016, a herd was released in the Maashorst Nature Reserve in North Brabant. Zoos in 30 countries also have quite a few bison involved in captive-breeding programs. ^ Olech, W.; IUCN SSC Bison Specialist Group (2008). "Bison bonasus". The IUCN Red List of Threatened Species. 2008: e.T2814A9484719. doi:10.2305/IUCN.UK.2008.RLTS.T2814A9484719.en. Retrieved 11 January 2018. ^ a b c d Soubrier, J.; Gower, G.; Chen, K.; Richards, S. M.; Llamas, B.; Mitchell, K. J.; Ho, S. Y. W.; Kosintsev, P.; Lee, M. S. Y.; Baryshnikov, G.; Bollongino, R.; Bover, P.; Burger, J.; Chivall, D.; Crégut-Bonnoure, E.; Decker, J. E.; Doronichev, V. B.; Douka, K.; Fordham, D. A.; Fontana, F.; Fritz, C.; Glimmerveen, J.; Golovanova, L. V.; Groves, C.; Guerreschi, A.; Haak, W.; Higham, T.; Hofman-Kamińska, E.; Immel, A.; Julien, M.-A. ; Krause, J.; Krotova, O.; Langbein, F.; Larson, G.; Rohrlach, A.; Scheu, A.; Schnabel, R. D.; Taylor, J. F.; Tokarska, M.; Tosello, G.; van der Plicht, J.; van Loenen, A.; Vigne, J.-D.; Wooley, O.; Orlando, L.; Kowalczyk, R.; Shapiro, B.; Cooper, A. (18 October 2016). "Early cave art and ancient DNA record the origin of European bison". Nature Communications. 7 (13158): 13158. doi:10.1038/ncomms13158. PMC 5071849. PMID 27754477. Retrieved 26 November 2016. ^ a b c Palacio, Pauline; Berthonaud, Véronique; et al. (1 January 2017). "Genome data on the extinct Bison schoetensacki establish it as a sister species of the extant European bison (Bison bonasus)". BMC Evolutionary Biology. 17 (1): 48. doi:10.1186/s12862-017-0894-2. ISSN 1471-2148. PMC 5303235. PMID 28187706. ^ a b Marsolier-Kergoat, Marie-Claude; Palacio, Pauline; et al. (17 June 2015). "Hunting the Extinct Steppe Bison (Bison priscus) Mitochondrial Genome in the Trois-Frères Paleolithic Painted Cave". PLOS ONE. 10 (6): e0128267. doi:10.1371/journal.pone.0128267. ISSN 1932-6203. PMC 4471230. PMID 26083419. ^ "70 years Wisent in the Caucasian mountains". www.lhnet.org. Retrieved 13 August 2015. ^ a b "bison, n.". OED Online. June 2011. Oxford University Press. ^ "wisent, n.". OED Online. June 2011. Oxford University Press. ^ Αριστοτέλης 4th century BC: Των περί τα ζώα ιστοριών. ^ "European Bison: The Animal Files". ^ "torontozoo.com (2011)". Archived from the original on 15 October 2011. Retrieved 22 September 2011. ^ The Holocene distribution of European bison - the archaeozoological record. Norbert Benecke. Munibe (Antropologia_Arkeologia) 57 421-428 2005. ISSN 1132-2217. Refers to Liljegren R. and Ekstrom J., 1996. The terrestrial late Glacial fauna in south Sweden. In L. Larsson (Hrsg). The earliest settlement of Scandinavia and its relationship with neighbouring areas. Acta Archaeologica Lundensia 8, 24, 135-139, Stockholm. ^ The Holocene distribution of European bison-the archaeozoological record. ^ Markova, A.K. ; et al. (2015). "Changes in the Eurasian distribution of the musk ox (Ovibos moschatus) and the extinct bison (Bison priscus) during the last 50 ka BP". Quaternary International. doi:10.1016/j.quaint.2015.01.02 (inactive 14 March 2019). ^ Briggs, H. (19 October 2016). "Cave paintings reveal clues to mystery Ice Age beast". BBC.com. Retrieved 19 October 2016. ^ Tudge, Colin (1992). Last Animals at the Zoo. Washington, D.C.: Island Press. ISBN 978-1-55963-158-7. ^ "Zagłada i restytucja żubrów". www.oep.neostrada.pl. Retrieved 1 May 2017. ^ Verkaar, EL; Nijman, IJ; Beeke, M; Hanekamp, E; Lenstra, JA (2004). "Maternal and Paternal Lineages in Cross-Breeding Bovine Species. Has Wisent a Hybrid Origin?" (PDF). Molecular Biology and Evolution. 21 (7): 1165–70. doi:10.1093/molbev/msh064. PMID 14739241. ^ Gautier, M.; Moazami-Goudarzi, K.; Leveziel, H.; Parinello, H.; Grohs, C.; Rialle, S. J.; Kowalczyk, R.; Flori, L (2016). "Deciphering the wisent demographic and adaptive histories from individual whole-genome sequences". Molecular Biology and Evolution. 33 (11): 2801–2814. doi:10.1093/molbev/msw144. PMC 5062319. PMID 27436010. ^ Massilani, Diyendo; Guimaraes, Silvia; Brugal, Jean-Philip; Bennett, E. Andrew; Tokarska, Malgorzata; Arbogast, Rose-Marie; Baryshnikov, Gennady; Boeskorov, Gennady; Castel, Jean-Christophe; Davydov, Sergey; Madelaine, Stéphane; Putelat, Olivier; Spasskaya, Natalia N.; Uerpmann, Hans-Peter; Grange, Thierry; Geigl, Eva-Maria (21 October 2016). "Past climate changes, population dynamics and the origin of Bison in Europe". BMC Biology. 14 (93): 93. doi:10.1186/s12915-016-0317-7. PMC 5075162. PMID 27769298. ^ a b Pucek, Z.; Belousova, I.P. ; Krasiñska, M.; Krasiñski, Z.A. & Olech, W. (2004). European Bison Status Survey and Conservation Action Plan. Gland, Switzerland and Cambridge, UK. : IUCN/SSC Bison Specialist Group. ^ a b Brent Huffman. "Ultimate Ungulate". ^ Olech, W. (2011). Pers. comm. ^ Trapani, J. "Bison bonasus". Animal Diversity Web. ^ Krasińska, M.; Krasiński, Z. (2007). European bison - the nature monograph. Białowieża, Poland. : Mammal Research Institute. ^ Macdonald, D. (2001). The New Encyclopedia of Mammals. Oxford: Oxford University Press. ^ "Genetic status of the species". Bison Specialist Group - Europe. Archived from the original on 7 March 2013. Retrieved 17 June 2013. ^ "The Extinction Website - Species Info - Caucasian European Bison". www.petermaas.nl. Archived from the original on 11 July 2015. Retrieved 13 August 2015. ^ "Wisents in Slovakia: the population has increased three times since 2004". European Wildlife. 23 July 2013. Retrieved 23 July 2013. ^ "Die Wisente kehren nach Deutschland zurück - Wissen & Umwelt". Deutsche Welle. 11 April 2013. ^ Baczynska, Gabriela (28 September 2008). "FEATURE-Climate change clouds fate of ancient Polish woods". Reuters. Retrieved 28 September 2008. ^ "El bisonte europeo se reimplanta en España". Univision.com. 5 June 2010. Archived from the original on 6 June 2011. Retrieved 16 January 2011. ^ "Denmark's Bornholm island gets rare bison from Poland". bbc.co.uk. 7 June 2012. Retrieved 9 June 2012. ^ "Wisent rescue in Europe is only at the half-way point". European WILDLIFE. 13 January 2014. Retrieved 4 February 2016. ^ "В Беларуси подсчитали количество зубров". greenbelarus.info (in Russian). 10 March 2016. Retrieved 3 March 2018. ^ Pucek, Zdzsław (1 January 2004). European Bison (Bison Bonasus): Current State of the Species and Strategies for its Conservation. p. 15. ISBN 9789287155498. ^ "European Bison Brought back to Bulgaria". ^ "Number of wisents in the Czech Republic passes one hundred for the first time since the Middle Ages". European Wildlife. ^ "Mįslė gamtosaugininkams: kaip visą būrį stumbrų perkelti į Dzūkiją". DELFI. 9 January 2018. Retrieved 9 January 2018. ^ "History | Wisentproject Kraansvlak". www.wisenten.nl. Retrieved 17 March 2017. ^ "Wisent Maashorst". ARK Natuurontwikkeling (in Dutch). 17 March 2016. Retrieved 17 March 2017. ^ "Wisent op de Veluwe". Stichting Wisent op de Veluwe (in Dutch). Retrieved 17 March 2017. ^ Morris, Desmond (5 May 2015). Bison. Reaktion Books. ISBN 9781780234571. Retrieved 7 July 2018. ^ "Zubři na Slovensku: populace se od roku 2004 zvětšila téměř čtyřnásobně". Česká krajina. ^ OKIA. "Biggest bison transport ever Rewilding Europe". ^ "Denmark's Bornholm island gets rare bison from Poland". BBC News. 7 June 2012. Retrieved 8 June 2012. ^ Christoph Vetter (1 March 2010). "Wisente erobern die ITB". Westdeutsche Allgemeine Zeitung (WAZ), online edition. Retrieved 7 July 2013. ^ "Startseite - Wisent Welt". ^ "Second group of 3 European bison from Poland (Białowieża) was released today". Large Herbivore Network. Retrieved 14 June 2012. This article incorporates text from the ARKive fact-file "European bison" under the Creative Commons Attribution-ShareAlike 3.0 Unported License and the GFDL. Wikimedia Commons has media related to Bison bonasus. The Extinction Website – Caucasian European bison (Bison bonasus caucasicus). The Extinction Website – Carpathian European bison (Bison bonasus hungarorum).